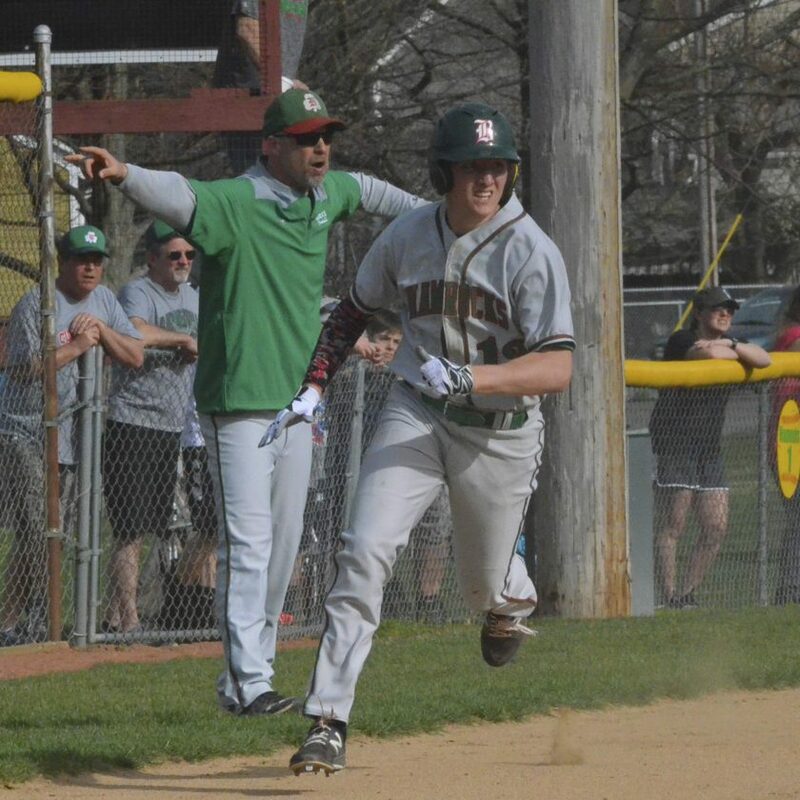 T-L Photo/RICK THORP Barnesville’s Ayden Hannahs rounds third Thursday as Shamrocks head coach D.J. Butler directs traffic in the background. Hannahs scored on the play, part of a three-run first inning in Barnesville’s 13-7 victory against Shadyside at Memorial Park. Hannahs was 3-for-3 with a walk and three RBIs in the showdown of OVAC class leaders. BARNESVILLE — Barnesville and Shadyside wasted little time in continuing their prowess at the plate Thursday as they met in their highly-anticipated prep baseball rematch. The Tigers opened the game by scoring two runs, then the Shamrocks followed with three. Barnesville continued the trend, though, by exploding for five more in the second and that set the table for a 13-7 triumph in a battle of OVAC leaders played before an overflow, bipartisan crowd at Memorial Park. “Shadyside is a good team,” Shamrocks head coach D.J. Butler said after his Class 3A leaders improved to 9-0. “I think they’ll make a deep run in the tournament and they’ll be good for a long time. Ayden Hannahs was 3-for-3 with a walk and three RBIs for Barnesville, which has handed Shadyside (10-2) its only losses this spring. Uryan Meade also had three RBIs, while Cade Hannahs and Jagger Jefferis each smacked two hits. Jefferis no-hit the Tigers in their first meeting. Shadyside, the Class 2A leaders, collected 13 hits this go around. The only question was, who was going to blink first defensively? Unfortunately for the Tigers, it was them, as four errors proved pivotal in the loss, according to their head coach — Shawn Selmon. “Defensively, we just didn’t bring it,” he said. “When you come out here and face a team like Barnesville that’s been on fire and hits the ball well, there’s no room for error. RBIs by Holmes and Anthony Coggins in the first gave Shadyside a 2-0 lead, but it was short-lived. In the bottom of the first, the Shamrocks smacked three singles, the big one coming off the bat of Ayden Hannahs, who knocked in two. He later scored himself on an error. “I kind of felt like as lackluster as we finished (Wednesday’s game) (a 7-6 victory against River), to get off to a good start was important,” Butler said. The veteran Barnesville skipper really liked what he saw in the second, when his team sent eight batters to plate, recorded four more hits and went ahead 8-2. Cade Hannahs, Jefferis and Ayden Hannahs all drove in runs, four of which came with two out. The score stayed that way until the fourth when Shadyside’s bats awoke. The Tigers batted around to the tune of five hits and scored five runs — all with one out. The big blow came courtesy of No. 9 hitter Mason VanNest. His bases-loaded double cleared the bags. Rhys Francis singled VanNest home moments later. And when Coggins flied out, Francis scored, making the score 8-7. Shadyside left eight runs stranded Thursday. Feeling the Tigers’ roar, Barnesville answered with two runs in the home half of the fourth increasing its lead to three. With two on via walks, Uryan Meade brought both runners in on a single. The two runners that scored on Meade’s hit — Ayden Hannahs and Alex Meade — scored from third and second and moved up there on a double steal moments earlier. Butler said he doesn’t hesitate to be aggressive on the basepaths. The Shamrocks, who’ve recorded four shutouts in 2019, tacked on three insurance runs in the sixth, with Uryan Meade and Riley Tubaugh providing the power. Both teams return to action today. Barnesville visits St. Clairsville, while Shadyside welcomes Shenandoah.